The red mark on all those webcam shots appears to be a flare. It appears in front of clouds. http://poleshift.ning.com/profiles/blogs/please-place-your-planet-x [and from another]Example from Wiki http://en.wikipedia.org/wiki/Sunset where it is clear the clouds above are wispy but at the horizon they appear dense and black. 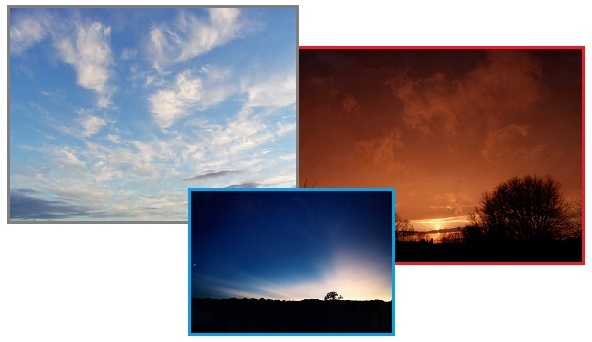 [and from another] The Colors of Sunset and Twilight http://www.spc.noaa.gov/publications/corfidi/sunset/ The most memorable sunsets tend to be those with at least a few clouds. Clouds catch the last red-orange rays of the setting sun and the first light of the dawn like a theatre screen, and reflect this light to the ground. Some of the most beautiful sunrises and sunsets feature solid decks of middle or high clouds that cover the entire sky except for a narrow clear strip near the horizon. The entire landscape takes on a surreal saffron hue as the clouds reflect the fading sun's red and orange glow, allowing very little blue (scattered) light from the upper levels of the atmosphere to reach the ground. [and from another] Atmospheric Opticshttp://en.wikipedia.org/wiki/Atmospheric_optics When the angle between the sun and the horizon is less than 10 percent, as it is just after sunrise or just prior to sunset, sunlight becomes too red due to refraction for any colors other than those with a reddish hue to be seen. Light can shine through clouds or fog. It is very dense clouds that block sunlight, and even then not completely. These Italy webcam images are taken at dusk, and clouds in the distance at these times appear more dense than they in fact are. They are wispy. The darkness at sunset in distant clouds is due to the lack of white light bouncing around in the clouds, but they are thin, wispy. The Second Sun sightings occur at dawn or dusk, when the curve of the Earth facilitates the bending red light to become dominant. The clouds in this Italy region and the time of day are your clues. What are the clouds like during the day, overhead by the Sun? Has this been researched?